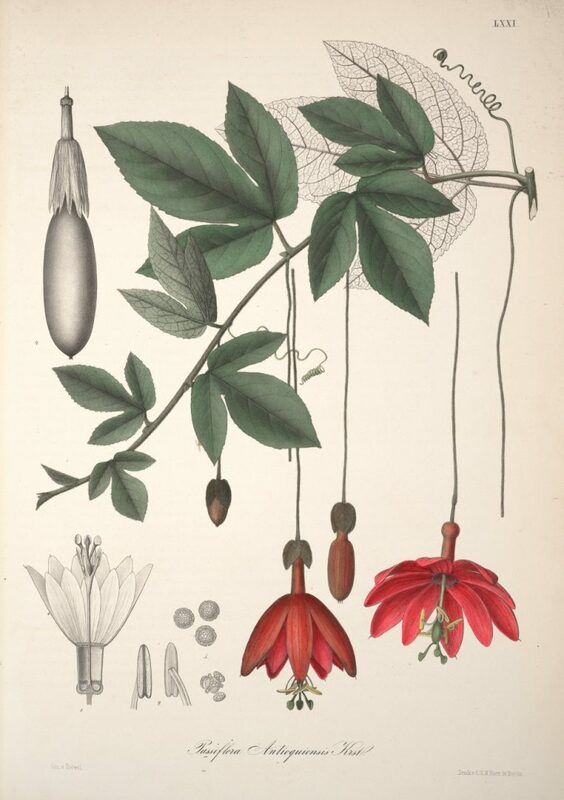 Passiflora antioquiensis is probably second only to its fellow Tacsonia Passiflora parritae for being difficult to grow outside its natural habitat. Historically P. x exoniensis has often been misidentified as P. antioquiensis. 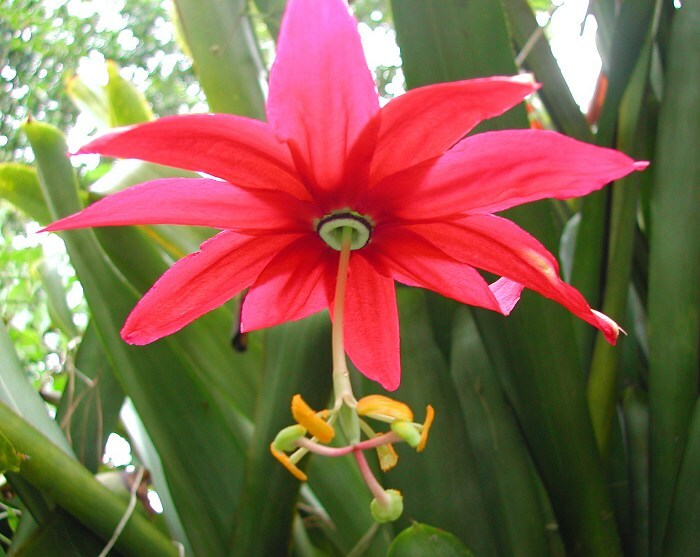 One of the most beautiful Passiflora, the red flowers dangle down on stems (peduncles) two feet long or more. Like most hummingbird pollinated species the flowers will stay open for a few days compared with bee pollinated Passiflora flowers which usually open for just one day. Why? There are a lot more bees about than hummingbirds. 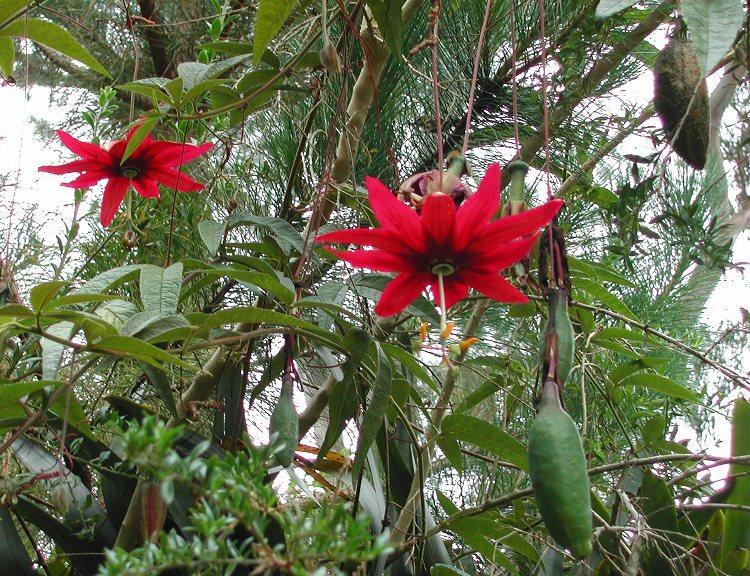 P. antioquiensis is from the mountainous cloud forest Antioquia area (from native words meaning the “hill or mountain of gold”) of Colombia around Medellin. This is a beautiful area of rolling green hills and distant mountains. It is close to the equator with no distinct seasons, though it tends to be more rainy with afternoon downpours in the latter half of the year. The natural climate for P. antioquiensis is a cloudy wet eternal spring with daytime temperatures under 29°C/85°F & even in December at night no lower than 6°C/43°F. It is a fussy plant, but far less so than many imagine, that wilts easily & enjoys high humidity (which reduces transpiration) & needs heavy watering. It will not tolerate a hard frost in UK or too much direct sun or heat when grown in USA. With the lower light intensity in UK however direct sun is not a problem providing that it is well watered at all times. I have measured 90°F/32°C on it and Henk Wouters reports that it will survive over 38° C/100° F. Nevertheless it is better grown in shade. What will finish it and other Tacsonia are the roots overheating in a plastic pot in full sun. If it overheats it will dry out and die very quickly especially if there is insufficient temperature drop at night. Many Passiflora can come back from being almost totally dried out but Tacsonia do not seem to have evolved needing this ability. 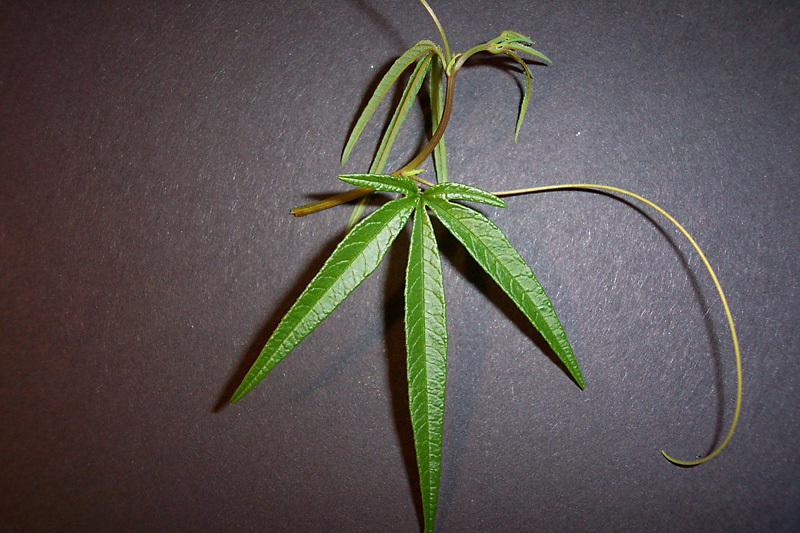 It is also difficult to root cuttings as is P. parritae. P. antioquiensis will only grow well outside year round in a few places outside it’s natural habitat. 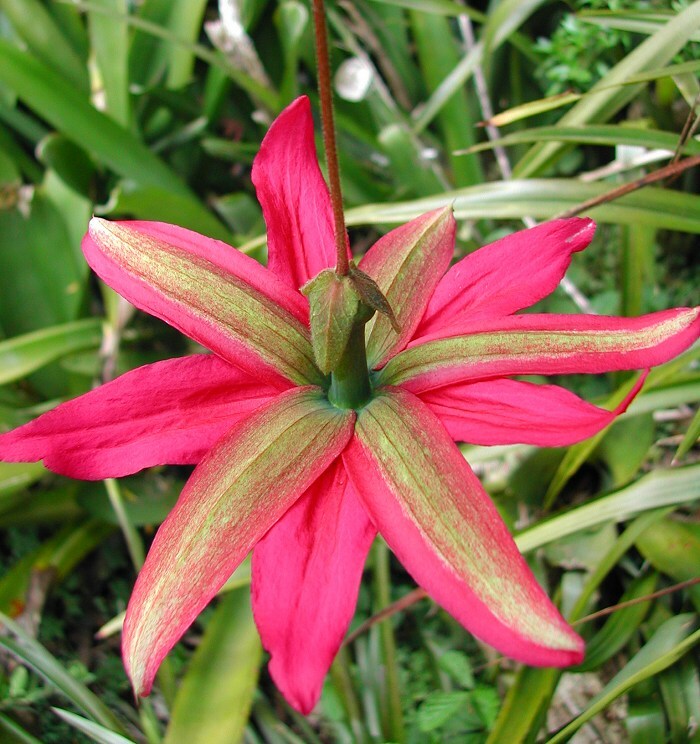 To date in San Francisco at Strybing Arboretum, Northland in New Zealand & Dr. Les King advises that it is also grown as a food crop in Madeira. It flowers January to the beginning of winter. The fruit are tasty though quite big seed best left uneaten. 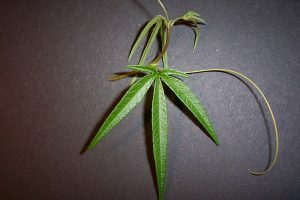 It is thought to be dimorphic with one or 3 lobed leaves but it appears that when grown from seed the foliage, particularly when juvenile, can throw up occasional 4-5 lobed leaves as above. There does appear to be some clone variation. It is easy to grow in Uk over the summer months but will not survive even light frosts. I hardiness tested it over winter & even well protected with fleece in a mild winter of min -3°C 27°F it died. 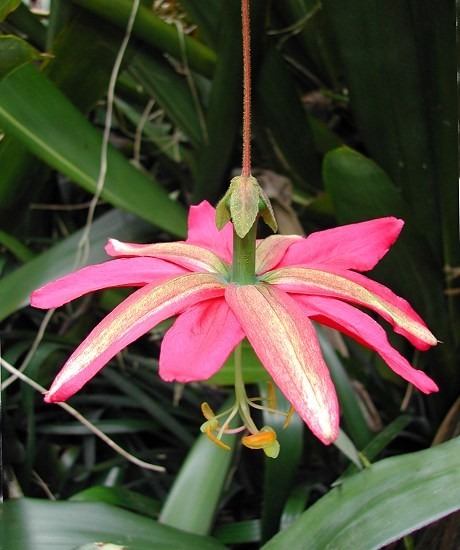 In 2008 Carlos Rendon created a fantastic hybrid Passiflora ‘Mission Dolores’ (Passiflora parritae x Passiflora antioquiensis) named after a local Mission in San Francisco. 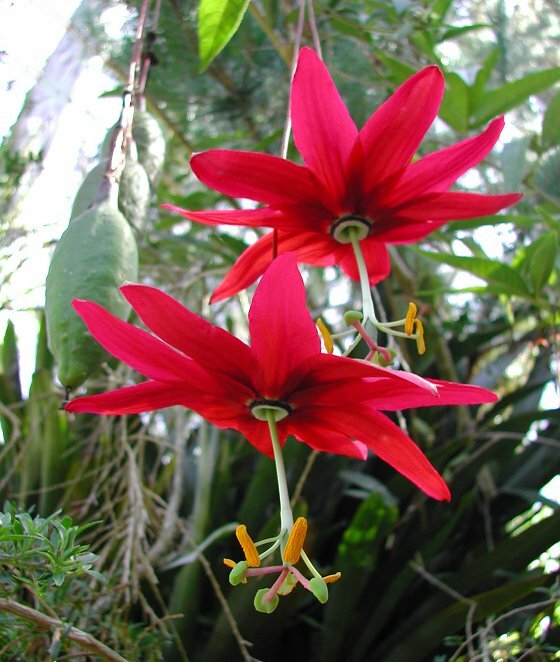 It has a large reddish/pink flower on very long peduncles, It is less temperamental than either parent and more vigorous.